Are you or your organization interested in learning more about how to apply principles of Calm Technology to your products? A workshop on Calm Technology is a great way to do it! Want to bring Calm Technology to your conference or team? ‍Please get in touch!Calm Technology workshops can be bundled with a speaking engagement or commissioned separately. 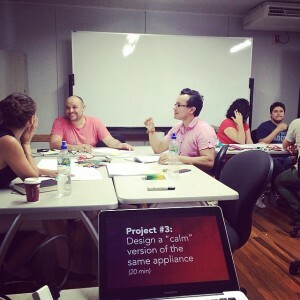 Designing Calm Technology Workshop in Costa Rica, 2014. This workshop is for anyone that actively builds or makes decisions about technology, especially user experience designers, product designers, managers, creative directors and developers. Attendees are encouraged to have some background in user experience design and look at http://calmtech.com/or Designing Calm Technology before the workshop. Any number of participants is possible, although no more than 60 participants is recommended. The average workshop length is 3-4 hours. I can work with your needs as well. Book a Workshop for your Conference, School or Team.